Military and aerospace equipment makers, driven by the DoD’s modular open system approach (MOSA), commercial-off-the-shelf (COTS) directives and the need to reduce size, weight, power and cost (SWaP-C), are now adopting open, bladed architectures such as AdvancedTCA and MicroTCA to meet their high performance embedded computing (HPEC) requirements. 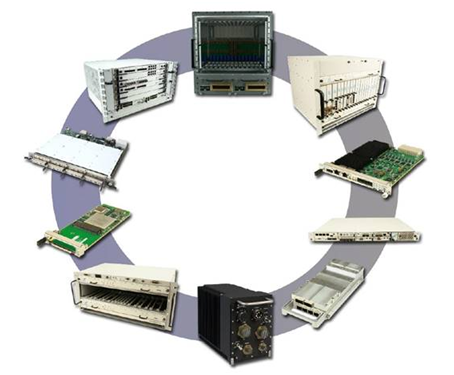 The adoption of ATCA and MTCA is growing most quickly in network-centric defense and avionics applications that require high end computing with more IO than is possible in standard servers and which have environmental requirements greater than a typical data center. This includes high performance, ultra-reliable network-centric equipment for signal processing, data acquisition, situational awareness, data processing & communications, data recording, and more. Our focus is on creating technology based on these open standards that is tailored to the specific needs of military and aerospace prime contractors, with particular expertise in SWAP-C optimized solutions and life cycle management. In addition to commercial-grade products, we build specialty IO blades, carrier blades and chassis to help you create innovative, high-performance mission-critical solutions that operate anywhere, every time. Prime contractors trust our expertise in areas such as sensor processing, where we have deployed ADC solutions up to 56GSPS.We offer both convection and conduction-cooled systems, and options for meeting MIL-STD-810F and 901D for shock/vibration and MIL-STD-461E for EMI. Our large selection of open architecture COTS hardware includes processing technology from Intel, Freescale and Cavium, FPGA devices, PCIe, SRIO and up to 40GbE fabric interconnects. We have a proven track record of leveraging leading-edge silicon technology into COTS form factors, with a long list of firsts to our name. A focus on designing innovative products that can be deployed in harsh environments, with uptime reliability for heightened data-processing demands, outstanding global technical support and a focus on the needs of military and aerospace application makes VadaTech’s COTS technology the right choice.